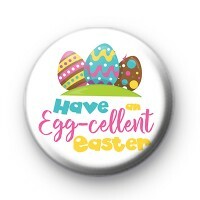 This brightly coloured 1 inch Easter themed badge, has the fun slogan, Have an Egg-Cellent Easter. These would be lovely pinned on the front of Easter cards or as a small Easter gift to your students, children or in party bags. Make sure you check out our huge selection of Easter Badges - there are so many to pick from. All our badges are handmade by us in Cornwall.